In Brighton this weekend for a birthday celebration, which meant heading straight out of the station and cycling down to the beach, where friends were playing cricket on Brunswick Lawns. This is close to the remnants of the old West Pier and there is something about its charred skeleton that is rather beautiful, like a artist's sculpture celebrating the Victorian art of pier-building. It seems far more emblematic of the town than the blandness of the nearby Palace Pier. In the evening I was at one of the town's oldest pubs, the Victory Inn, which is right in the middle of Brighton's Saturday evening madness of hen-nights and raucous drinking. It was sweltering and many of us spent as much time outside in the street as we did in the sticky upstairs room. It was a great place for people-watching, for thankfully avoiding the Jägermeister and Red Bull cocktails that appeared at some point during the party and for remembering that Brighton has always been rather shambolic, in spite of the Regency grandeur of the Hove end of the city. 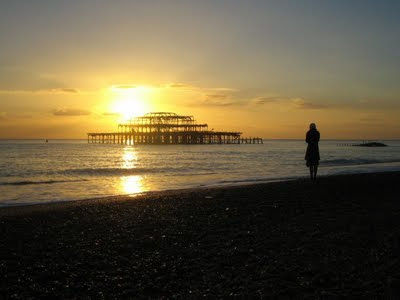 There are still plans to rebuild the derelict West Pier, which burnt down in March 2003, using funds raised by a still illusive Brighton Eye tower on the promenade. But I hope they leave it as it is. The new apartments up by the station, which could be anywhere in the country, will never be the soul of Brighton. That honour lies still with the old town and its off-shore architectural ruin. I love brighton too. And incidentally my friend runs 'The Victory' - Great pub which i thoroughly reccommend. Thanks anon - I'd recommend it too. When you speak to your friend next, tell him/her that the private party in on Saturday evening for Helen and Dean's 40th birthdays had a blinding time. Like your description of the West Pier, is is very apt. Don't know the Victory Inn, been in there not when I lived in B'ton but visiting as a trade union delegate. I still have a soft spot for the place and end up there mainly due to trade union conferences.